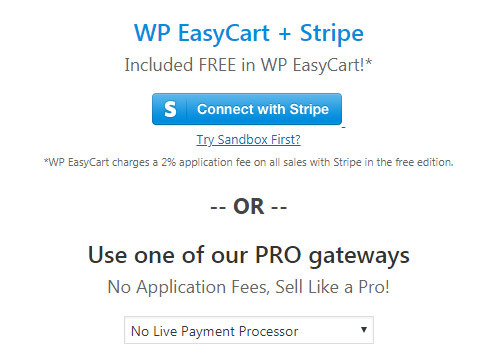 Stripe is the most comprehensive integration WP EasyCart offers with full payment processing AND extensive subscription/recurring payment integration. We offer Stripe in our FREE edition with 2% application fees, or use our Pro and Premium edition licenses to get 0% application fees. 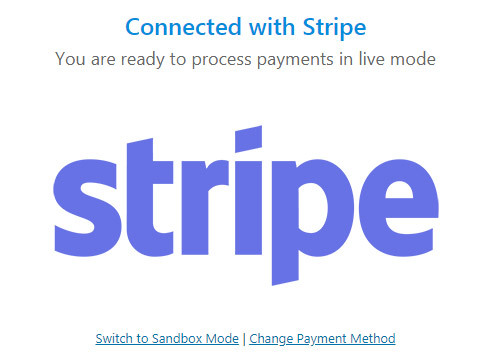 Sandbox: Stripe offers you a sandbox mode. This is great for testing and can be connected to by using the ‘Try Sandbox First?’ or if you have already connected your live account just click the ‘switch to sandbox’ link. Please note, for sandbox mode you can skip the Stripe form by clicking the link at the top of the screen. If you wish to enter your own API keys from your Stripe account, you may do so by selecting Stripe from the live gateway drop down box and follow these instructions. First, log into your Stripe account and then navigate to the API section. Note: If you place stripe into test mode and utilize test API keys, all subscriptions and test products are created in your test mode sandbox. It is important to always test payment processors in live mode as well to ensure they are working properly. Note: Stripe, as all live payment processors, requires your site to have a valid SSL, and be calling the checkout process via https:// for secure communications. Next, you can copy your publishable and secret keys and enter into WP EasyCart’s Stripe payment settings. This will allow you to process payments during checkout. Lastly, you will want to connect a webhook that talks back from Stripe to your EasyCart installation. This is necessary for all subscriptions and other communications that Stripe might want to send and update your EasyCart data. To access, simply click on the ‘Webhooks’ menu and then ‘+ Add Endpoint’ button in the top right corner. From here, you can paste the url provided back on your WP EasyCart stripe setup section.